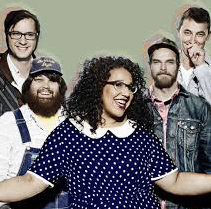 Alabama Shakes is an American rock band formed in Athens, Alabama in 2009. The band currently consists of lead singer and guitarist Brittany Howard, guitarist Heath Fogg, bassist Zac Cockrell, keyboard player Ben Tanner, and drummer Steve Johnson. The group rose to prominence from virtual obscurity in the early 2010s with their distinctive and soulful roots rock sound. The band began their career touring and performing at bars and clubs around the Southeast for two years while honing their sound and writing music. They recorded their debut album, Boys & Girls, themselves in Nashville while still unsigned. Online acclaim led ATO Records to sign the band, which released Boys & Girls in 2012 to acclaim. The album had a hit single, "Hold On," and was nominated for three Grammy Awards. After a long touring cycle, the band recorded their second record, Sound & Color, which was released in 2015 and debuted at number one on the Billboard 200.